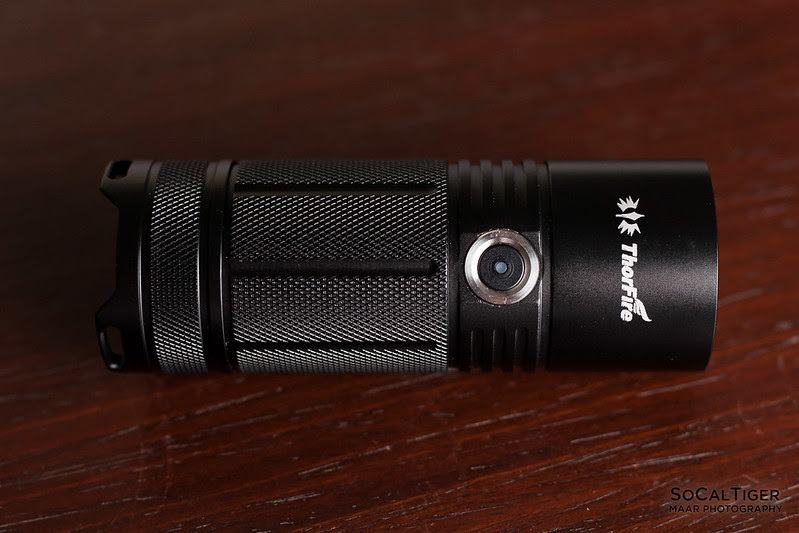 The Thorfire TK4A is Thorfire's 4xAA flashlight. 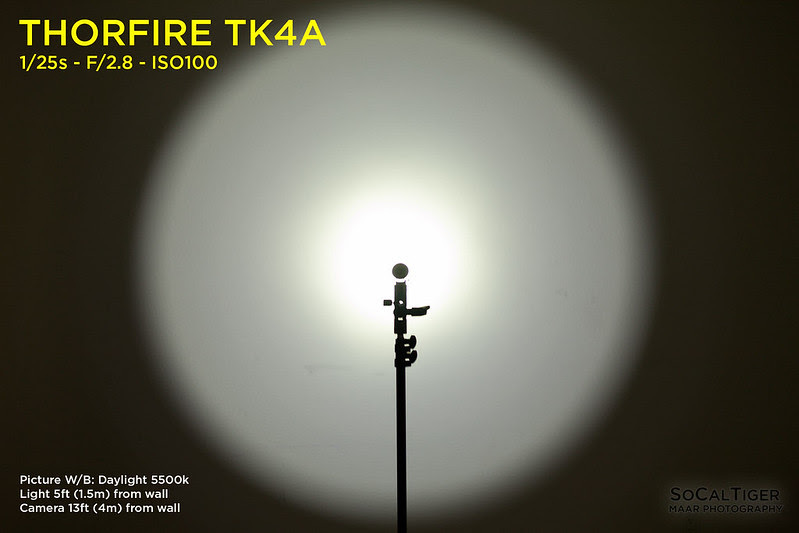 The TK4A is a small canister style light which utilizes a domed Cree XP-L in a throwy polished reflector. Output is speced at a max of 1100 lumens (I measured ~1200 lumens!) 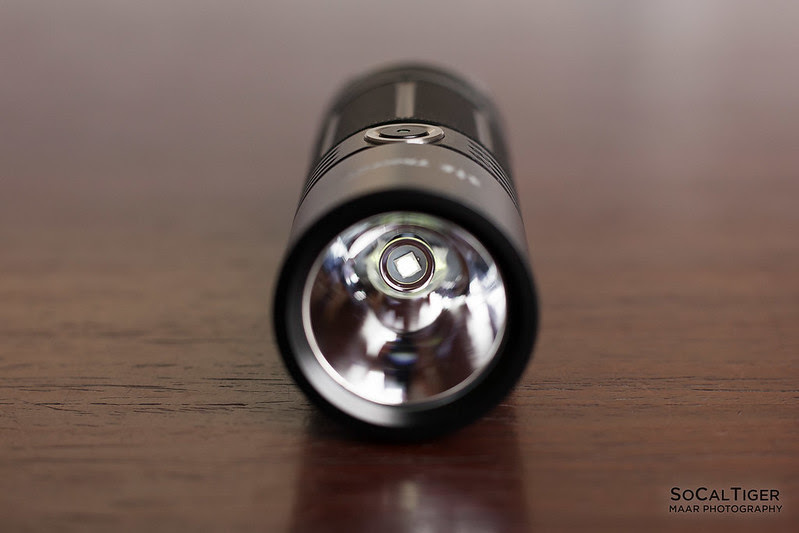 I'm a huge fan of any flashlight that can deliver high power from common AA batteries as I own literally dozens of Eneloops and use them in everything. I find NiMH batteries extremely convenient since I can store a couple dozen of them at full charge. I had the opportunity to evaluate the Thorfire TK4A and was provided a copy for review by Thorfire. 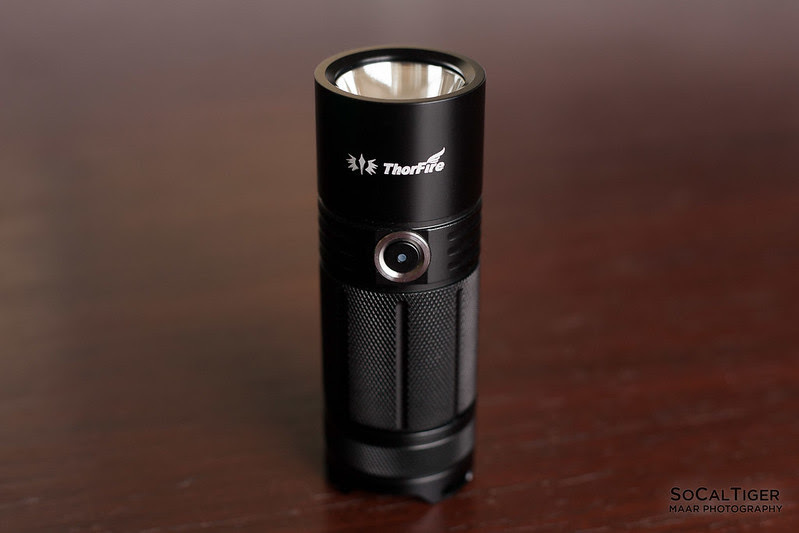 With up to 1100 lumens maximum output and 6 modes to choose from, ThorFire TK4A could be one of the most powerful and versatile AA flashlights. 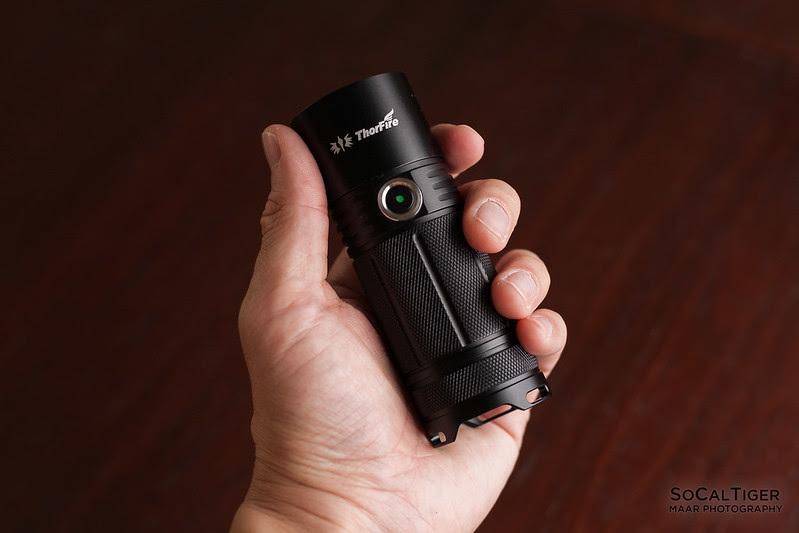 Furthermore, this powerful AA light also has mode memory for easy operation, it remembers the brightness level you use most (you need to stay at the mode for longer than 3 seconds ). The switch button have a battery indicator light. The light will displaying “Green”, if the battery capacity is higher than 50%. If it is lower than 50%, it will turn to “Orange”. When it less than 15%, it will changed to “Red”. Click the side switch to turn on, keep on clicking to change brightness levels from Low-Medium-High-Turbo, double click to activate Strobe mode, and another click goes back to the previous brightness level, press and hold the switch to turn off. When the light is off, press and hold to activate Moonlight mode, click to turn off.With the light OFF, press and hold the side switch for 1 second goes to Moonlight. 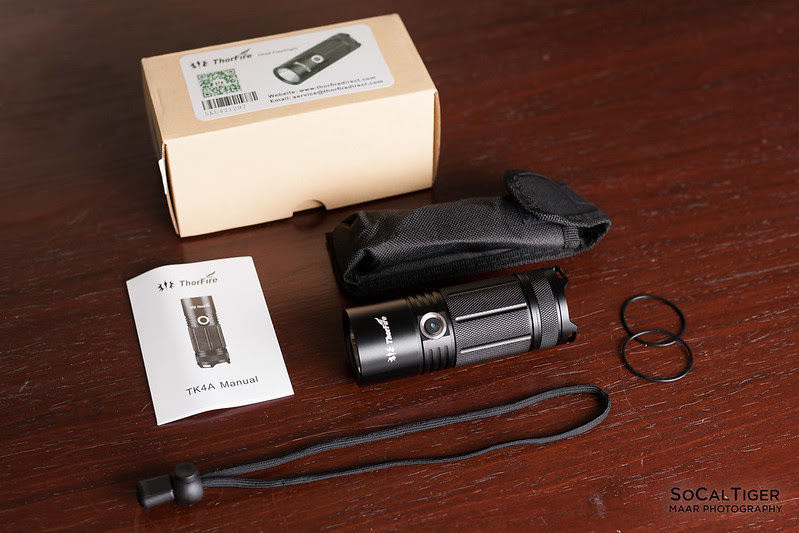 The flashlight will memorize the last used (more than 3 seconds) brightness level. The next time you turn the flashlight on, it will activate on the last used output. The TK4A arrived in a basic cardboard box. There is foam padding on both the top and bottom of the box. Additionally, the light is in a bubble-wrap sleeve. Accessories included 2 spare O-rings, a nice lanyard, carry case and manual. The packaging is more than sufficient in addition to the mailer packaging. 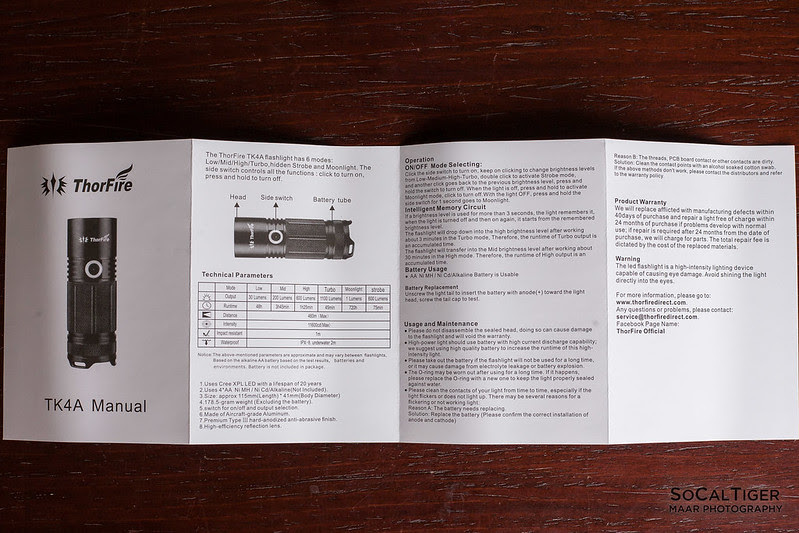 There is no significant risk of damage or scuffing to the light during delivery using this packaging. This packaging is better than I have seen for some other lights (in other lights I've experienced scuffed finishes from poor packaging). 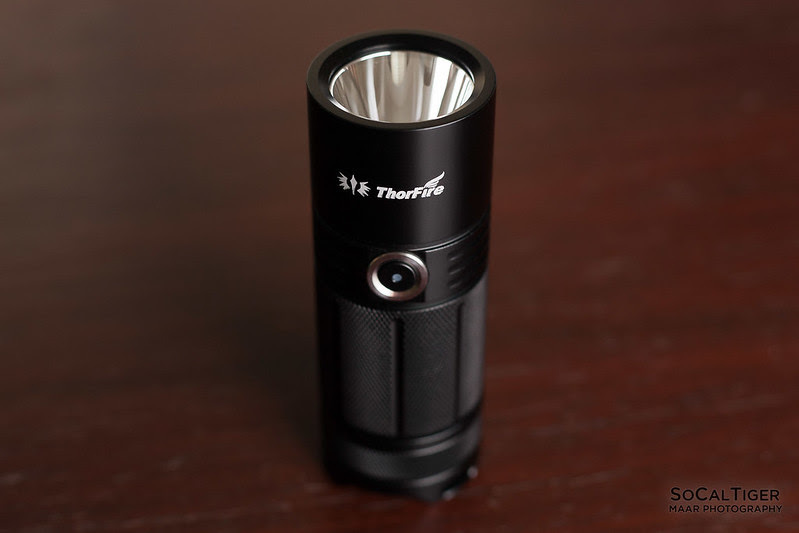 The TK4A has smooth black anodizing. The anodizing was applied well and my copy did not have any notable defects in the finish. The anodizing has a nice non-glossy sheen and I feel that this finish looks very nice and professional in quality (cheaper lights have an overly glossy or painted-on appearance). The body of the light is what I call a canister design. Some people describe this as a "soda can" light. The width is similar to a Redbull can. Due to the design, there is no roll-resistance. I would attach the lanyard if rolling is an issue. The center and tail of the body has a subtle diamond pattern knurling which adds grip, a clean look, and some scratch resistance. The knurling is not overly aggressive and it feels good in hand. This is perfect for use bare-handed. The threads are square. I did lube the threads once I got the light and they slide nicely. The TK4A includes a nice thick lanyard. The lanyard is more than sufficient for this light and in fact it is thicker throughout than what I've seen for some heavier lights (for example, the Nitecore EA81 lanyard has a very thin attachment section). The fact that the lanyard is a single segment adds confidence as there are less points of failure. I also like that the lanyard is adjustable. In order to install the lanyard, I had the turn the "thread" of the lanyard sideways so that it would slide in the holes. This is good as I prefer this over thinner designs. 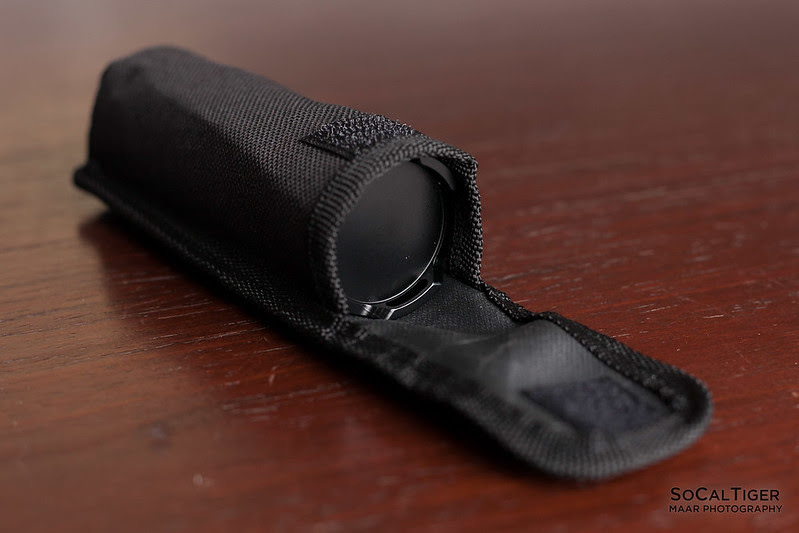 The TK4A includes a carry case which can be attached to a belt loop. The TK4A fit snugly without being too tight. If you are wearing this on a belt, you might want to attach a lanyard to make it easier to take the light out. The TK4A can tail-stand on a level surface and is very stable due to having 3 contact areas along the outside ring on the tail. This is combined with the lower center of gravity of a shorter and wider light. 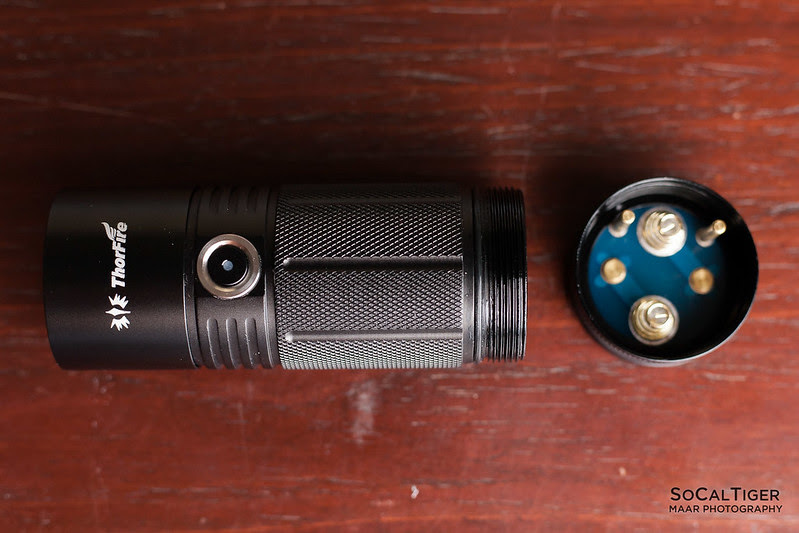 I feel that this is more stable than most flashlights. However, installing the lanyard will de-stablize tail standing somewhat. The light uses a single side-switch. UI works using full presses, long-presses and double-clicks (no short/partial presses). There is mode memory. The light will activate on the last used brightness. Moon is hidden (long-press when off). Strobe is hidden (double-click when on). To turn the light ON, press switch. To advance modes, press switch. To turn the light OFF, long-press switch. To turn STROBE ON, double-click switch (when on). To turn STROBE OFF, press switch (will return to previous mode). To turn MOON ON, long-press switch (when off). To turn MOON OFF, press switch (will turn light off entirely). Comments: This is my preferred order for larger/brighter lights (starting at low). However, I would have preferred that if you started at Moon, you could continue up the normal rotation (ML -> L -> M -> H -> T) instead of turning off the light after Moon. Measurements were done using brand new and freshly charged 2000mAh Fujitsu NiMH AAs (equivalent to 2000mAh Eneloops) using a quasi-integrating sphere. I estimate Turbo exceeds spec at roughly 1265 on activation and 1196 after 30 seconds. 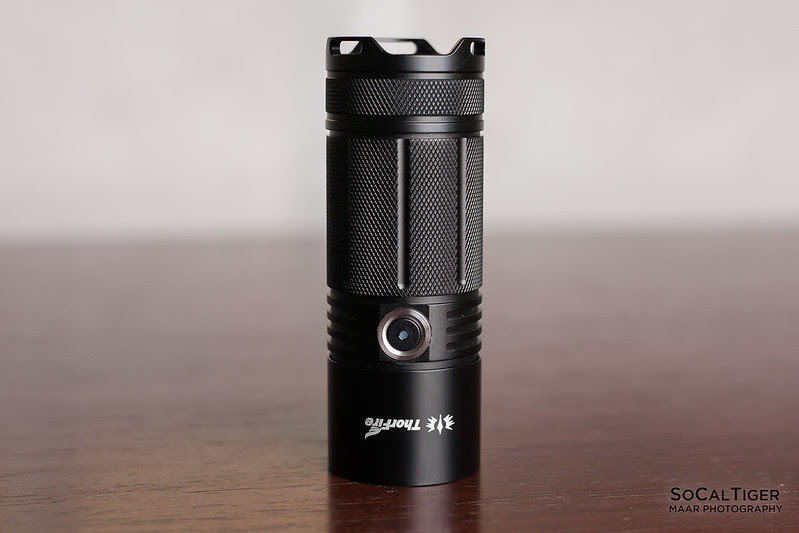 This makes it a 1200 lumen light by ANSI FL 1 standards. High is 463 after 30 seconds. The moon mode was so low that it didn't register. Moon is at least 100 times dimmer than low. I am estimating that it is <= 0.1 lumens. This mode is ideal for reading a map in the dark without blowing your night vision or when you only want minimal illumination. Personally, I would prefer Moon at 1 lumen. I believe that the TK4A might be using very high frequency PWM (Pulse Width Modulation). PWM was not detected by other reviewers at all. I barely was able to detect it on Low. I suspect it may be there on High and Medium but it would be impossible for me to tell without an electronic Hz measurement. I could not detect any PWM on Moon. The PWM frequency is very high and unlikely to bother anyone. This light has timed stepdowns when on Turbo or High. * When on Turbo, the light will stepdown to High after 3 minutes. * When on High, the light will stepdown to Med after 30 minutes. * The user can manually step back up the power. * The light does not get that hot on High, so I suspect that the stepdown at 30 minutes is in the interest of saving energy as well as to address people leaving the light on by accident or wanting long run-times. * This test was done with a constant cooling fan. Ambient temperature in my house was 78F (25C). 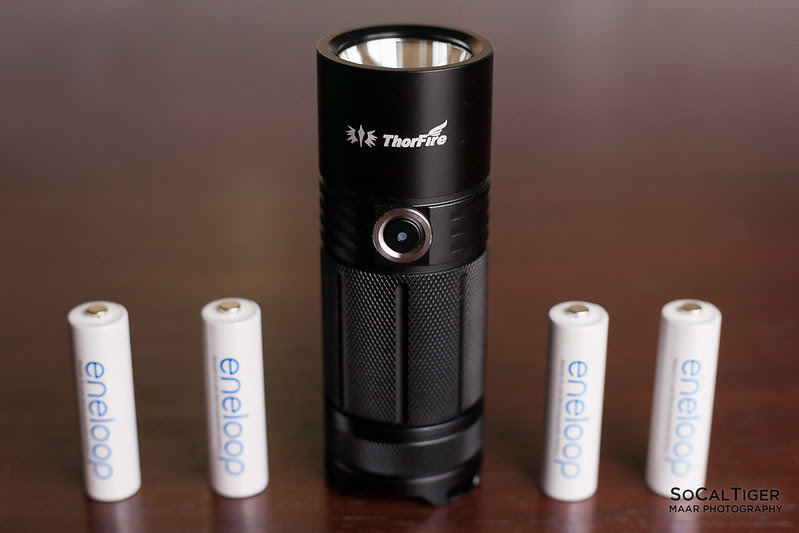 * WalkIntoTheLight reported that the light will last for almost a full 12 hours total on 2000mAh Eneloops and that medium output is more or less level for 10-11 hours. This far exceeds Thorfire's specs. This is extremely good and I love the long run-times. * Given the long run-time on Medium, I suspect that Low and Moonlight have insanely long run-times. Moderately Throwy. 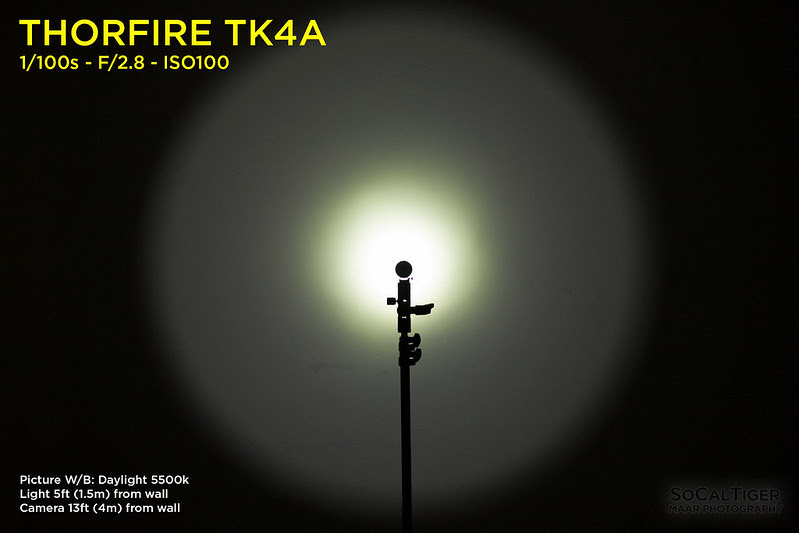 The TK4A uses a domed XP-L combined with a polished reflector so the hot spot is relatively tight with a somewhat defined corona that transitions nicely with a good amount of spill. In practice, I find this to be a well balanced beam. This will contrast with a dedicated thrower in that it is better suited for general outdoor usage. This is the type of pattern which I would normally use for a hike or walk. Indoors or close-up, a flooder is preferred. 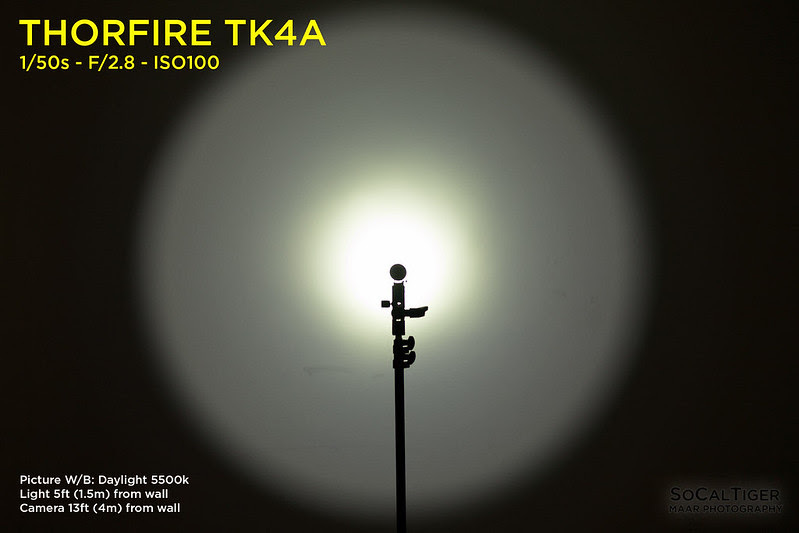 The color temperature is right in the neighborhood of 5500-6000K. I estimate mine as 5700K (cool neutral) using Lightroom's Auto WB. 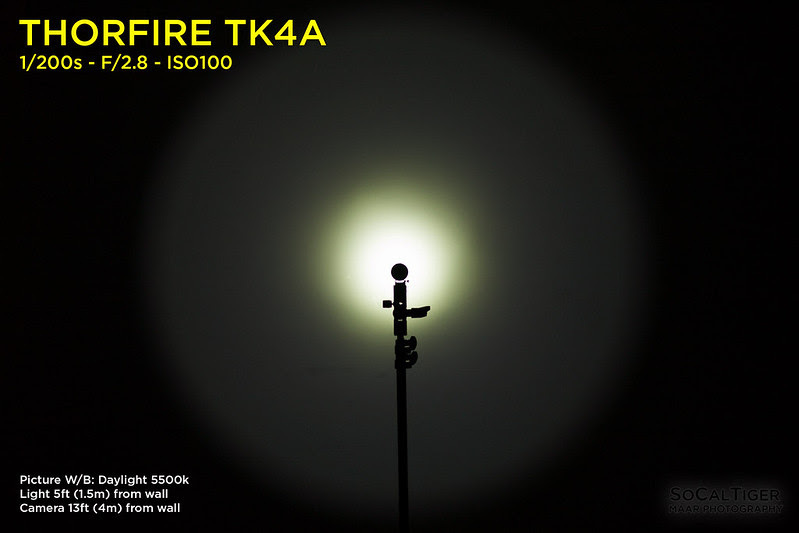 When white-balanced in Adobe Lightroom against "Daylight 5500K", the beamshots appear neutral. The light appears pure white in practice and this is a good choice of default color temperature. Personally, I would love if they also had an option for a warmer tint in the neighborhood of 4000-4500K. 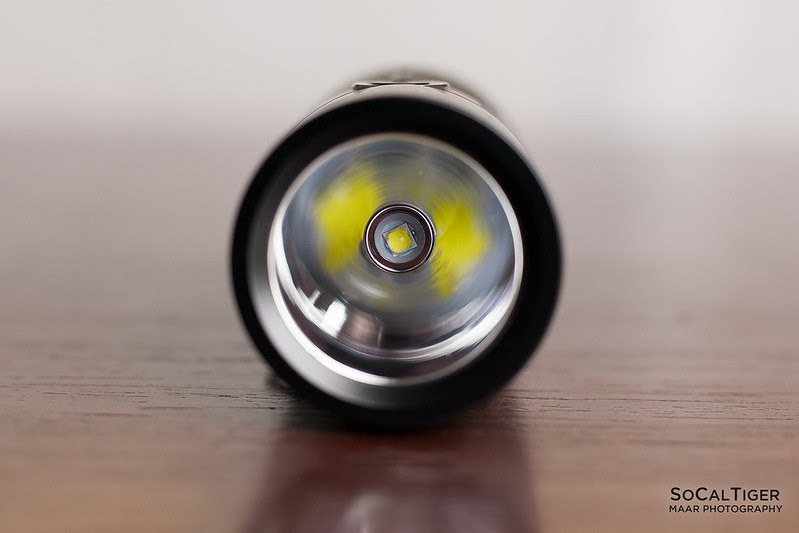 When the flashlight is turned on, the button has a built-in battery indicator. 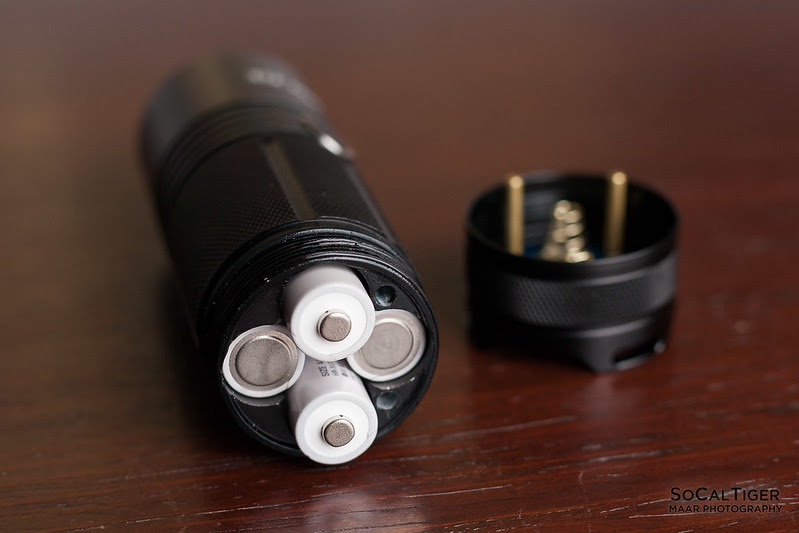 I think that this is super convenient and I wish that ALL flashlights had something like this built-in. I also find that having a lighted button made it very easy to use the button in the dark. Note 1: The Thorfire website says the Green/Orange threshold is at 60% but Amazon says the threshold is at 50%. It is not stated in the manual. Note 2: In a practical test, I used the flashlight for roughly 10 minutes outdoors during a walk. Using charged 2000mAh Fujitsu NiMHs, the light turned Orange after about 7 minutes (3 minutes on High and 4 minutes on Medium). When I charged the batteries, my Xtar VC4 reported roughly 600mAh. So, I think that the light turns Orange closer to 60-70% capacity with NiMH. 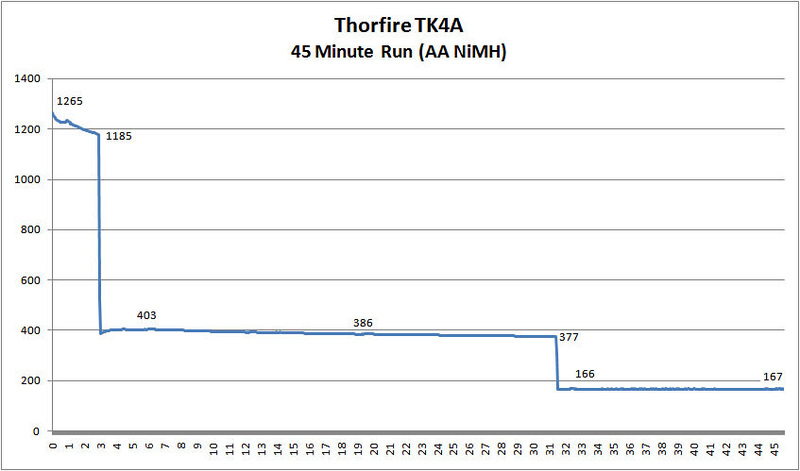 The TK4A is powered by 4xAA (NiMH, alkaline, etc.). I primarily use 2000mAh NiMH LSD (Eneloop and Fujitsu). 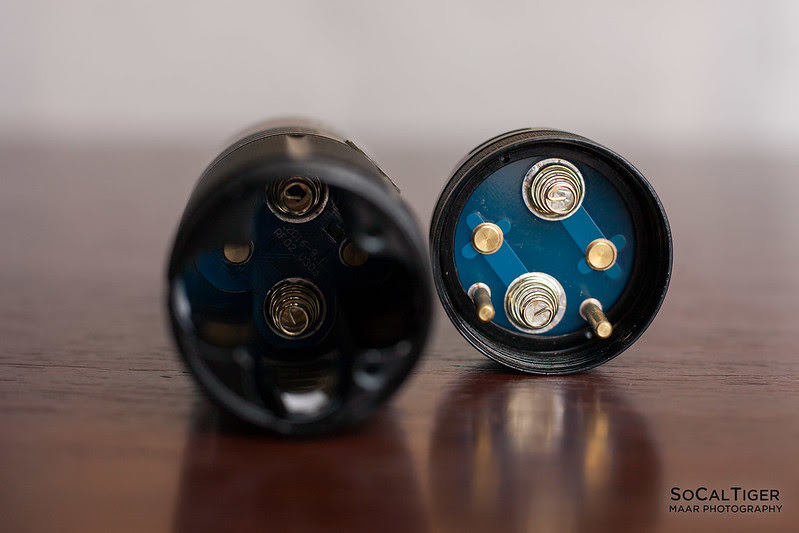 When using AAs, I recommend using rechargable NiMH batteries such as Eneloop because these rechargables will not leak the same way that alkalines do. If using alkalines, be sure to replace them frequently especially once they are drained. Alkalines are most likely to leak in hot environments (like in a car) or when drained. Both my Eneloop and Fujitsu 2000mAh NiMH AAs fit fine. 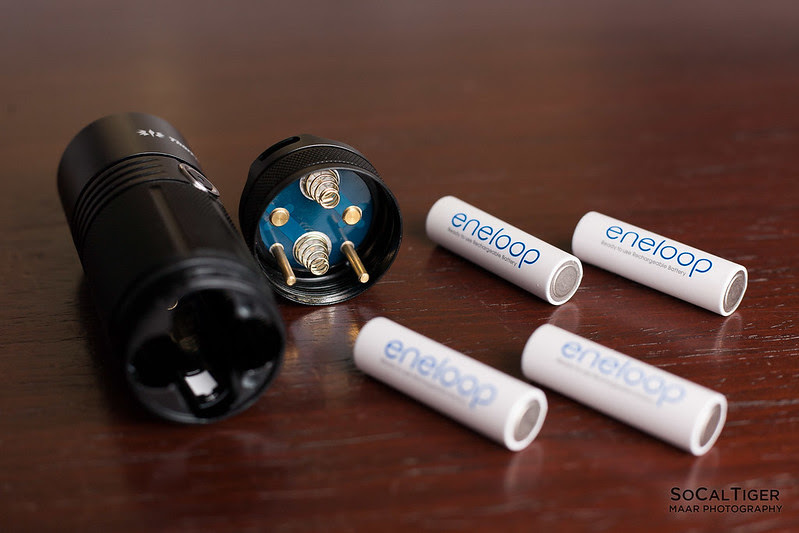 robo819 confirmed that the high capacity 2550mAh Eneloop Pros (which are physically wider) fit. For long-term storage such as a light left in a car or emergency kit, some people consider using lithium-primary AAs (ex: Energizer L91). Disclaimer: Use of lithium primaries is not officially stated as a supported battery type and I cannot verify whether or not there may be potential issues. Please do your research before going this route. Do not use 4x14500 lithium-ion batteries - the voltage will damage the light. There is no physical or electronic lock-out. If there is a possibility of accidental activation, you should remove the batteries entirely if possible. 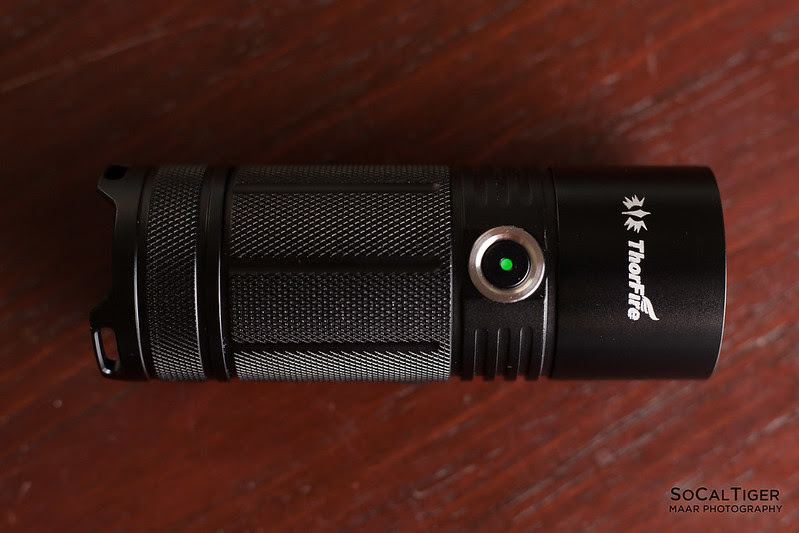 This is a good, well-built 4xAA light and produces ~1200 lumens on Turbo. This light also has amazing run-times if you allow it to automatically step-down to Medium. This light handles heat well and you could keep it in High until the batteries died without getting hot. I really like the small size -- it would fit in larger pockets (like cargo shorts). I also think that it is small enough that you can unobtrusively wear it using the case on a belt when camping, etc. without being so large that it is always smacking into things or awkward. The lanyard is also nice and thick. The finish looks excellent, is clean and my copy had no defects. The modes are well-spaced. However, I would prefer that the "moon" setting be around 1 lumen and that moon was part of the normal mode rotation (not hidden). I also prefer no memory (or configurable) on most lights. 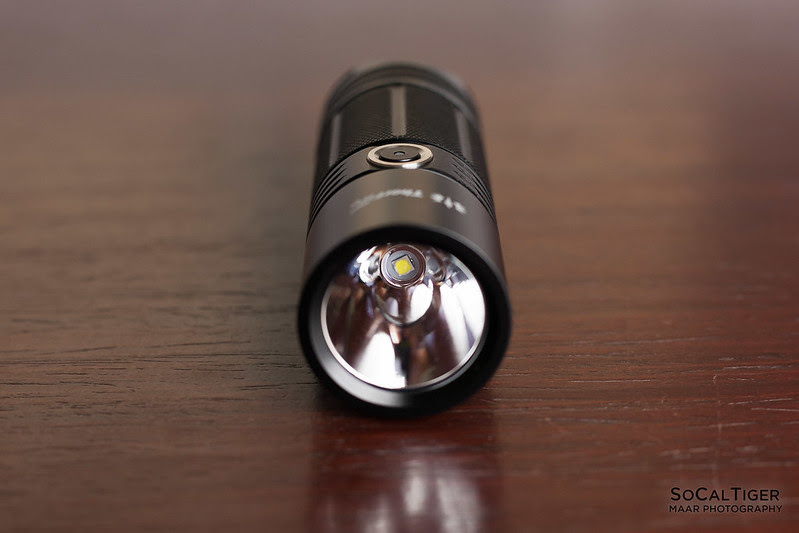 The beam profile is moderately throwy and well-suited for general outdoor usage. The color temp is 5700K (cool neutral). It would be great if there was a warm to neutral white option. Thanks for the review. I’m still doing mine, but I can confirm the PWM. It’s at 21 kHz so visible only to cameras in certain situations. Thanks for confirming. No other reviewer was able to detect it so glad to know that I’m not crazy. Nice! I like this size light. It fits the hand well. And I too have Eneloops begging to be used. 1200lm is quite a nice output! Yeah, I really love the form factor on this light. Not too wide and not too thin and it gives a lot of punch for using just 4xAA. It’s a really nice balance of output and size for people who have/prefer AAs. Does this light have low-voltage shutdown, or will it continue running to the point of causing reverse-polarity damage to the lowest-capacity series cell?